Big skies, braided rivers, vast plains and snow-capped mountains: Canterbury has beauty and drama in all directions. At the heart lies Christchurch, once with a settled charm and lively cultural scene that was disrupted in 2010 and 2011, when the region experienced a swarm of earthquakes. These redefined Canterbury's physical and cultural landscape. Canterbury lies halfway down the South Island, on the eastern side. Sheep farming was important in its history, and there are still small country towns. But the main centre, Christchurch, is New Zealand’s third largest urban area. 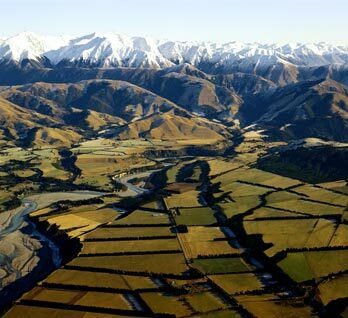 From the air, the Canterbury plains form a patchwork of neatly laid-out farms. This flat land stretches from the coast to the Southern Alps. By car, you head towards these snowy peaks along straight roads that seem to go on for ever. The Waimakariri, Rakaia and Rangitātā rivers flow from the mountains and across the plains, where they divide into shallow braids. The coastline has open beaches, but there are smaller bays on Banks Peninsula. Canterbury is one of the country’s driest regions, but there are frosts in winter, and snow in the high country. On summer days there is sometimes a hot, dry nor’west wind, and a high arch of clouds in the sky – the nor’west arch. Ngāi Tahu and earlier tribes lived mainly where there was food – by the sea and at Te Waihora (Lake Ellesmere), which had lots of eels. The government bought much of their territory in 1848, but broke its promise to keep enough land for them. The tribe was finally compensated in 1997. The London-based Canterbury Association aimed to recreate English rural society in Canterbury. From 1850, they sent out different classes of people – from rich landowners, to farmers, to shepherds and servants. The settlers had set up large sheep farms on the plains and in the hill country. Some farmers became rich exporting wool and meat (known as ‘Canterbury lamb’). Near the end of the 19th century these runs were divided into smaller farms. Country and town people get together on Christchurch’s annual Show Day in November. Christchurch, ‘the garden city’, has tree-lined streets, the winding Avon River, some splendid old buildings that survived the quakes, and thousands of cyclists. Creative New Zealanders have worked there – including artists W. A. Sutton and Doris Lusk, poets Ursula Bethell and Denis Glover, and novelist–theatre director Ngaio Marsh. The city has always had plenty of choirs and brass bands. There are many other cultural activities, arts and crafts, and festivals. And it is easy to go wine-tasting, hiking, fishing, skiing or mountaineering. Canterbury is also an important rugby region. The red-and-black Crusaders team have won several major rugby competitions. On 4 September 2010 Canterbury was affected by a magnitude 7.1 earthquake. No one died, but buildings in Christchurch were damaged. On 22 February 2011 a magnitude 6.3 earthquake caused 185 deaths and major damage to Christchurch. Thousands of people were made homeless. The region was further affected by a magnitude 7.8 earthquake which struck on 14 November 2016. Two people lost their lives. The damage was most significant in the north of the region and neighbouring Marlborough.